Now that our children are back to school, we find ourselves trying to get back into our routine: forcing early mornings, eating breakfast, doing homework, and pushing bedtimes. We all have concerns for our babies. Will they do well with school? Will they like their teacher? How will they handle peer issues? The list goes on and on. So, how can we help our children to be their best? As moms, with our millions of hats, what can we do to have a lasting impression on them so that they can reflect on their childhood with positive memories and have the skills to handle life’s challenges as adults? There is considerable research that suggests it is not a big house, expensive toys, the latest fashionable clothes, or the like that equals success for children as adults. Rather, when we look at parenting, there are two key elements that successful kids carry with them into adulthood—honestly, grace and grit. Give your children the gift of grace. Children need an adult who listens to them. Hopefully, this is a parent, but for some children, it cannot be. However, successful adults can recall an adult who truly cared for them when they were young. As a licensed psychologist, when I ask how they knew that person cared, they always say, “They listened. It did not matter how trite or little my concern was; the adult genuinely listened with concern and care.” The adult made them feel like no one else mattered at that moment. They felt heard. Just remember: listening equals love to most children. Sometimes it is hard to stop and listen. I get it; I work full time, have two children, am married, and the list goes on. However, it can be done in little moments. This morning, I woke my daughter up to get ready for school and she was tired. We just returned from California (we live on the East Coast) and the time change was hitting her hard. She crawled into my lap and said her tummy hurt. I listened to her talk about her pain as it moved from her stomach to her head to her left leg and then her right finger. As her mom, I knew she did not have pain and could have easily said, “You aren’t sick, let’s go.” Believe me, the thought crossed my mind as I really wanted to get out the door early as I was jonesing for a Starbucks refresher, but I stopped and said to myself, “She needs you, Mom.” So, I listened to her pain; I let her tell me she did not want to eat yogurt for breakfast (but rather donuts), that she hates nap time at preschool, and so on until she was done. (Honestly, it took less than five minutes and fighting her would have taken at least 10 minutes.) When she finished her diatribe, she said, “But, Mom, I will go to school and have a good day because I always do; besides, Eliza [her best friend] would miss me if I don’t.” I hugged her and told her I knew she would have a great day because her attitude was set for a great day. I reminded her of all her amazing qualities, and we began our day. I hope that I helped in setting her up for a great day and also planted a seed for her to have a positive outlook on life, no matter what happens. Most importantly, I was attentive to what she had to say. So, when life throws those curve balls, she knows her momma will be there to listen and help her along the way. And if she is talking to me, then I will hopefully have the inside scoop on her social world even when she gets older (which also helps with my mom anxiety). Parenting takes a lot of grit. The next bit of advice requires grit on behalf of the parent: your parenting style. This is something I am talking a lot about lately. It’s partly because I am a parent and am always evaluating my parenting skills, but it’s also because I analyze parents as a forensic psychologist working in family law. I am seeing a huge influx of permissive parenting, and, quite honestly, it scares the heck out of me. What is a permissive parent? One that is super loving, supportive, empathetic, but who gives no structure, discipline, or guidance. If this is you, please stop doing this; it is so damaging to your child. There is research that goes back to the 1960’s that shows children who have permissive parents have an increase in depression, anxiety, school dropout, teen pregnancy, drugs, and the list goes on. Yes, children need warmth and unconditional love (refer back to my first tip), but they also need structure, routine, and discipline. Those things provide security for your children and help them know that their world is safe. They can predict mom will be home at 6 pm—then dinner, homework, a bath, and bedtime. That calms any fears. They appreciate parents disciplining them (despite their initial adverse reaction) because it teaches them how to not make mistakes in the future. See, children want to be good. Structure, routine, and discipline all allow them to be good, which builds their happiness and confidence. So, parents, if you truly love your child, then show your love with rules and discipline. They will thank you in the future. In parenting, there are two key elements that successful kids carry with them into adulthood. If you are struggling with either of these elements, below are some tools for you. Do not bring your phone into your child’s room so that you do not become distracted. Have a “Mom and Me” journal—a private place where a child can ask their mom any question or share something, and the mother can respond in the journal. (Hey mom, this gives you time to think of your response rather than being put on the spot.) There is one, key rule for this to be successful: anything in the journal stays in the journal and cannot be talked about outside of the journal. Have dates with your child. These are small outings, just the two of you. Listen to songs you like during the car ride and do something you both enjoy. It does not have to be all day or costly; it could be as simple as a walk around the block talking. Make it a point each day to listen and respond kindly to something your child says. As a psychologist, I refer parents to the Love and Logic parenting series. Honestly, they have a Love and Logic for every issue under the sun (super smart marketing), but if you pick up one, you will figure out the skills. If Love and Logic looks overwhelming, STEP (Systematic Training for Effective Parenting) is another good tool. It provides smaller and simpler steps in how to help guide and discipline your child. Look for a role model, someone you think parented well and whose children turned out well. Ask that person to mentor you. If none of that seems to be working, or you want to try a different route, you can always reach out to a child psychologist. We get that the task of parenting is not easy, but can help you create tools that work for you and your child. So, Mom, I hope you know that with a little grit and grace you can provide a loving, structured environment in which your child can flourish. 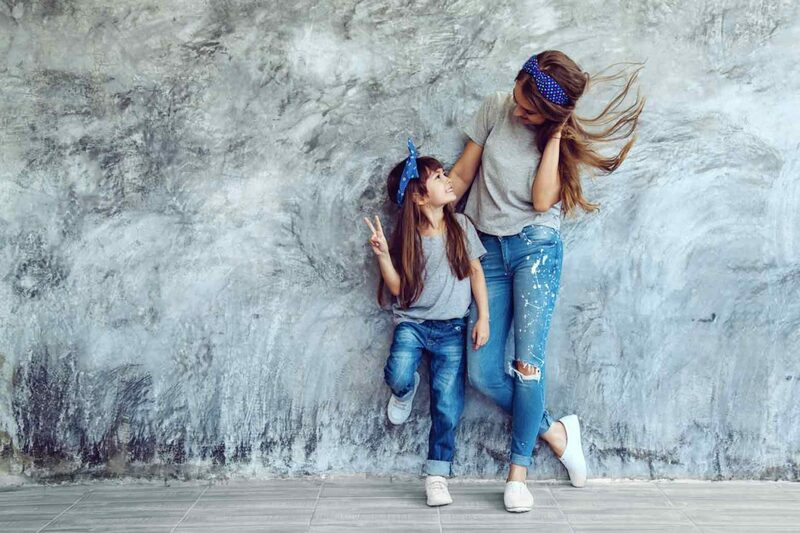 For more momming resources, don’t miss this recent podcast episode from This Grit and Grace Life: How Can You Raise Great Girls? Darlene’s Daughters Tell All – 054! And get Darlene’s book here for those of you raising great girls! You’ll also like A Little Encouragement When Motherhood is Disappointing, When You Want to Completely Change Your Parenting Style, Do You Have Core Values in Your Parenting?, Why I Don’t Have Just One Parenting Style, and How to Make Your Man Feel Like a Great Father.